When I think about memorable holiday moments, it is hard to ignore the Christmas that my cousin Jimmy was in jail. My sister, brother-in-law, then-husband, and I, marched in from the cold, shook off the chill, and proceeded to take off our coats to reveal matching T-shirts that read “FREE JIMMY.” We got a pretty good laugh but had little time to pat ourselves on the back, because we had to quickly change before Jimmy’s side of the family arrived. Truthfully though, one flip through the ol’ family photo album and all of my Christmas memories come flooding back. In hindsight, I now realize how fortunate I was to be the oldest cousin on my Mom’s side. Because every one of my Christmas Eve outfits saw three wears post-me. You can basically figure out what year every picture is taken just by doing some quick math. If I wore the red plaid dress in 1979, it is likely that my sister Sharon wore it in 1982, my cousin Kim in 1983, and finally my cousin Ali in 1987. The male cousins suffered the same fate. The powder-blue-three-piece suit that Michael wore, then Dan, then Jimmy (pre-jail) was a little hard on the eyes by the time 1985 rolled around. Then, of course, there was the Christmas of my first year of college. In August I left for the #1 party school in the nation. By Christmas break, I was home in NJ with all of my belongings, and registered for the local community college. Apparently, straight-A Courtney and #1 party school did not mix. So, when I arrived at our Christmas Eve destination and was greeted by my cousin’s husband who said, “Merry Christmas, even though you’re a college dropout,” the holiday spirit was pretty much sucked from the room. If only I had known that years later his son would be in jail (yup, same Jimmy), I might have spoken my mind. And, if my cousin hadn’t divorced him a few years later, he would know that I went on to graduate with a 3.7 GPA and had an even higher GPA in grad school. How’s that for merry, buster? If you look at the picture of me from that very Christmas morning circa 1991, you’ll see me in my West Virginia University sweatshirt. That is the 18th such picture in that series: me, turning the corner, at the bottom of the stairs to see what was under the tree. The rule in our house was that you couldn’t go downstairs until Mom and Dad were awake. And, once they were awake, you had to wait for them to set up the cameras (including video) so they could capture that moment when we first saw all of the presents piled under the tree. Every year we played along. No matter how old I got, I still savored that moment. Before we headed downstairs, we would “do our stockings,” which hung on the cardboard mantle. Oh, you read correctly. We didn’t have a fireplace in our house, so my parents purchased a three-dimensional cardboard fireplace that they would lug out of the attic each year and affix to the wall so we could hang our stocking by the chimney with care. I still don’t know how that thing survived more than a dozen Christmases with stockings weighing in at a combined 30 pounds easily. It truly is a Christmas miracle. Now, while we had to wait to get near the tree on Christmas morning, our dog Fritz had the run of the house. Which is why when he peed on baby Jesus in the manger, I wrote a story about it (career foreshadowing). 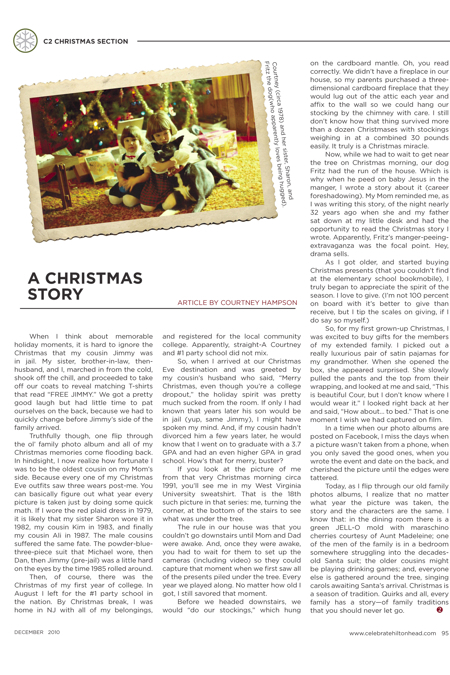 My Mom reminded me, as I was writing this story, of the night nearly 32 years ago when she and my father sat down at my little desk and had the opportunity to read the Christmas story I wrote. Apparently, Fritz’s manger-peeing-extravaganza was the focal point. Hey, drama sells. So, for my first grown-up Christmas, I was excited to buy gifts for the members of my extended family. I picked out a really luxurious pair of satin pajamas for my grandmother. When she opened the box, she appeared surprised. She slowly pulled the pants and the top from their wrapping, and looked at me and said, “This is beautiful Cour, but I don’t know where I would wear it.” I looked right back at her and said, “How about… to bed.” That is one moment I wish we had captured on film. In a time when our photo albums are posted on Facebook, I miss the days when a picture wasn’t taken from a phone, when you only saved the good ones, when you wrote the event and date on the back, and cherished the picture until the edges were tattered. Today, as I flip through our old family photos albums, I realize that no matter what year the picture was taken, the story and the characters are the same. I know that: in the dining room there is a green JELL-O mold with maraschino cherries courtesy of Aunt Madeleine; one of the men of the family is in a bedroom somewhere struggling into the decades-old Santa suit; the older cousins might be playing drinking games; and, everyone else is gathered around the tree, singing carols awaiting Santa’s arrival. Christmas is a season of tradition. Quirks and all, every family has a story—of family traditions that you should never let go.